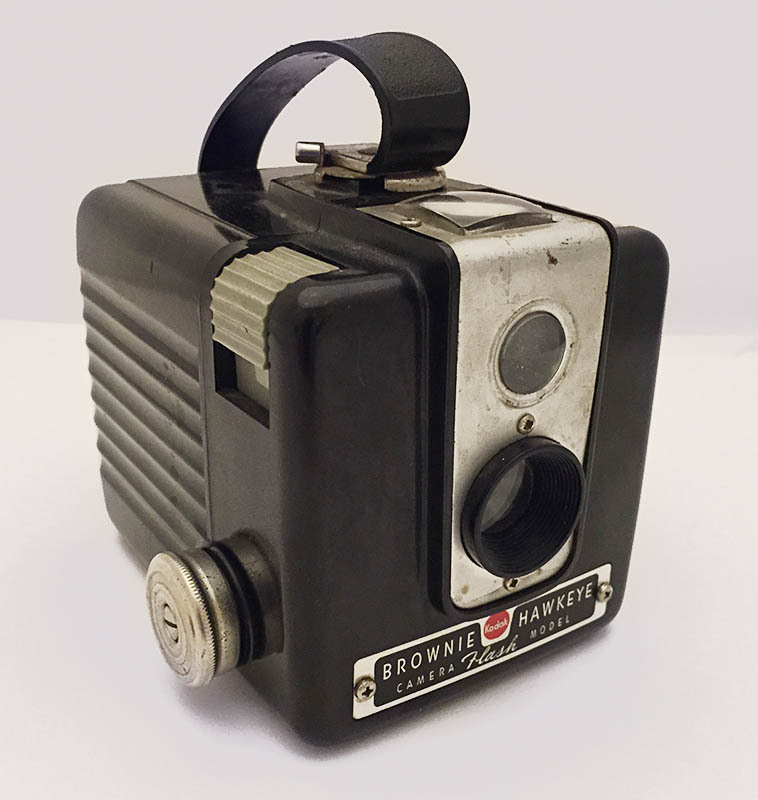 One of Kodak's famous consumer cameras was the Brownie Hawkeye. I picked mine up a few years ago at Goodwill Outlet. It looked rough around the edges, but guess what it works. 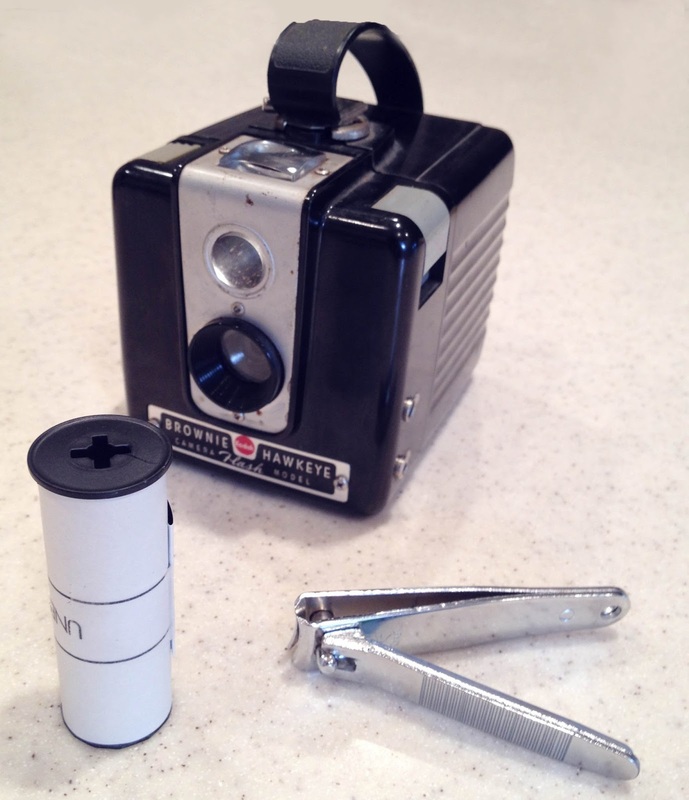 The Brownie Hawkeye was introduced in 1949 and produced until 1961. Mine was made in 1951, so it's older than me. Mine is a Hawkeye Flash version. This version took a Kodak pin & screw flash attachment. 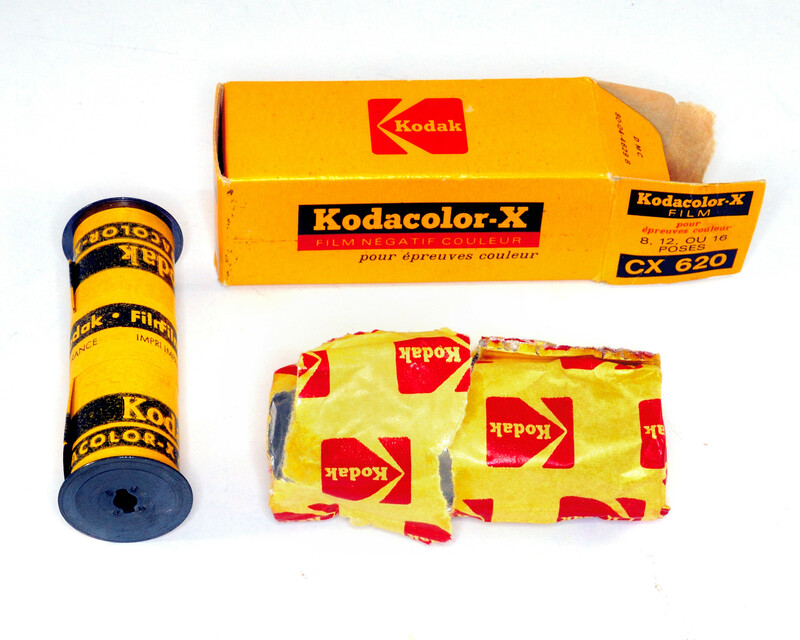 The camera took 620 sized film which is hard to find, but you can roll your own. Everything I read indicated that you couldn't use 120 sized film. However, you can cut down the ends of a 120 film roll and get it to fit. It's tight, but it worked. I simply used a set of fingernail clippers to clip down the ends. There are lots of websites on the Hawkeye camera that detail how to use it, how to load it, etc. I couldn't find much on the actual camera specs. However, physically, it has a look down viewfinder in-front of the top handle. The image is reversed in the viewfinder which takes a bit of time to get used to. It has a rotary shutter, but there is no other camera controls. The only control was to pull up the grey knob on the opposite side of the shutter release and it converts the camera to bulb mode. There is no adapter for a tripod, so you need to figure out another method to stabilize the camera during long exposures. The lens is what's called a meniscus lens. Here's a link if you want to read what a meniscus lens is. 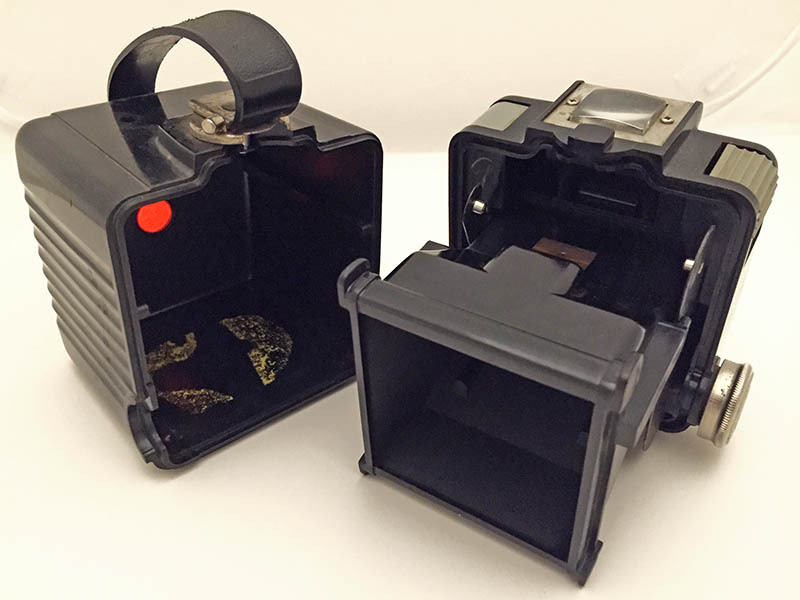 The camera produces a large 6x6 cm or 2.25x2.25 in square negative. Loading the camera is a snap, and there are even instructions on the inside. Very simple to open, just move the nob that's under the handle and the back pulls off. Simply load the film, close it back up and you are good to go. I've only shot one roll of converted Ilford XP2 Super 400 120 film through it, but it was fun. You sure get stares when you pull this out. It's easy to use, no focusing, to aperture, speed, ASA, or anything else to adjust. Just point & shoot. Perfect for street photography. Here is a photo from one of the parks in downtown Indianapolis during a bright but overcast day. There appears to be an unusual pattern on the images. Looks like something a pressure plate would create, but it doesn't have a pressure plate. Still a cool, old school soft look. 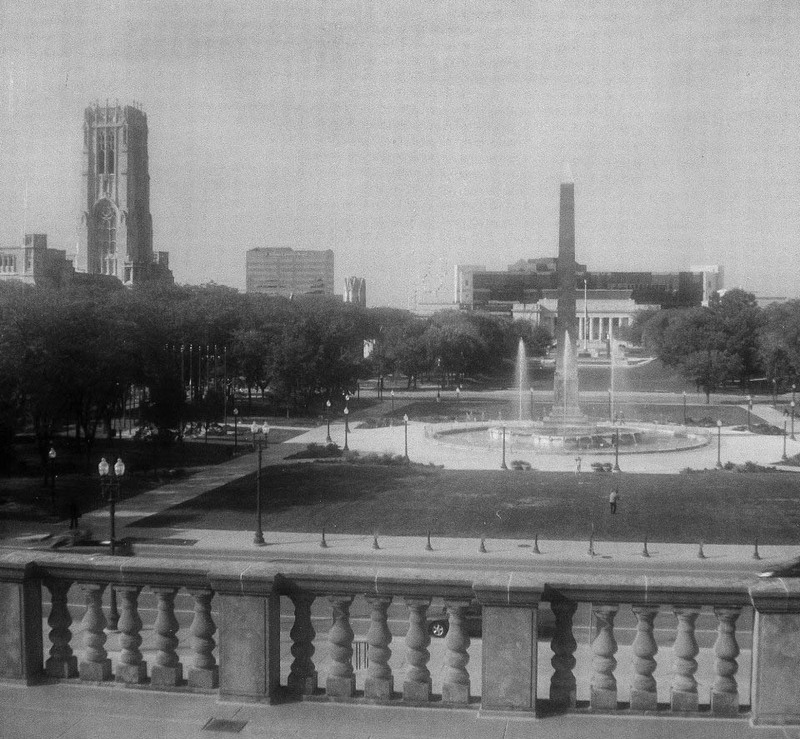 It almost looks like it was taken 50 years ago! So if you want to play with an old camera that's still fairly available and simple to use, get a Hawkeye flash.